Dermatosis Papulosa Nigra describes the presence of multiple, small, 1-5 mm diameter, smooth, firm, black or dark brown papules on face and neck of ethnic-skinned people. Dermatosis Papulosis Nigra can be removed permanently in one treatment. 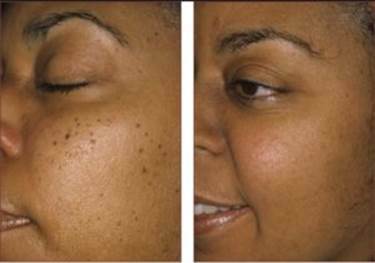 Depending on the number of Dermatosis Papulosis Nigra and the size of them, you can have multiple be removed during a treatment session. When treating Dermatosis Papulosis Nigra the technician will touch them with the tip of her probe while releasing current, the Dermatosis Papulosis Nigra will dry up and fall off on its own within days. In the case of larger Dermatosis Papulosis Nigra the treatment time will take longer as there is more preparation for the technician. Do not rub or scratch the area. A scab will form post treatment. It is important to let the scab heal naturally. This may take a week or two depending on the size of the Dermatosis Papulosis Nigra that was removed. It is important to keep the scab dry to allow for proper healing.